Especially today, Valentine’s Day, a holiday dedicated to pondering love and relationships. But seriously, what’s the MOST important relationship in your life? Whether you're in a committed intimate relationship or not, it's critical to have a fabulous, loving relationship with you. Because the more you can honor, love and respect yourself, the more others will too. Yup, love starts right here, right now with you loving on you. What’s that inner voice saying? Is she telling you how smart and capable you are? How gorgeous you look today? How you can do anything? If she's being mean, you're NOT being a nice friend to yourself, so kick those thoughts out and bring in the love. Every time you see yourself reflected back to you- whether it’s in a mirror, a car window, walking by a shop, or from a puddle, stop and look at yourself. It might seem a little strange at first but it is so powerful, empowering and energizing. Looking for love? Who isn't? Now that you have your list, begin to embody each and every one of those traits right now. In other words, become what it is that you're looking for. Like attracts like so as you up-level your vibration, you will attract exactly that to you. Years ago, I read that the author Isabelle Allende said that life is not measured by how many people love you but by how many people you love. Be the embodiment of love and watch how it reverberates throughout your life. Even if you’ve done years of therapy, inner work, or meditation, strands of unworthiness can suddenly appear. Usually when you least expect it and often when you’re trying something new or putting yourself out there and feeling more exposed. So here’s my latest unworthiness reframe- pretending I’m Muhammad Ali! Because what I realized is if I don’t think I’m the greatest, who will? So I leave you with a few of his inspired quotes. Pick one or say them all. 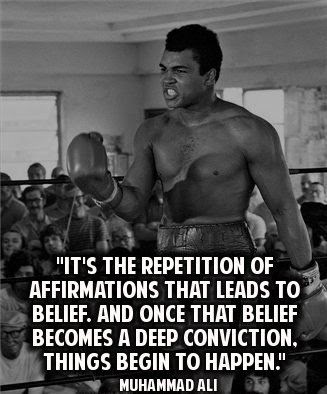 His power of conviction and absolute belief in himself literally transformed his life. And it can yours too. Enjoy being your greatest Valentine.